By Julia E. Stawarz, Department of Physics, Imperial College London, UK. In Stawarz et al. , we examine large- and small-scale properties of three ion-scale flux ropes in Earth’s magnetotail. Evidence of variability in the flux rope orientations is found and an electron-scale vortex is discovered inside one of the flux ropes. Magnetic reconnection, which releases stored magnetic energy and converts it into particle motion, is a key driver of dynamics in Earth’s magnetosphere. However, it is still not fully understood how particles are accelerated and energy is partitioned both within the reconnection diffusion region, where particles decouple from the magnetic field, and within reconnection outflows. Helical magnetic fields known as flux ropes are one type of structure generated by reconnection and often observed within reconnection outflows [Borg et al., 2012; Eastwood & Kiehas, 2015; Sharma et al., 2008], which are both theoretically [Drake et al., 2006; Dahlin et al., 2017] and observationally [Chen et al., 2008] linked with particle energization. Previous observations have shown flux ropes can have substructure and intense electric fields [e.g., Eastwood et al., 2007], but the nature of these electric fields have not been previously determined. Recent high-time-resolution, mutispacecraft measurements with electron-scale separations from NASA’s Magnetospheric Multiscale (MMS) mission finally allow us to examine the detailed substructure of flux ropes. The three closely spaced flux ropes examined in Stawarz et al. are observed near a reconnection diffusion region and have different orientations, indicating significant spatiotemporal variability and highlighting the three-dimensional nature of the overall reconnection event. One of the most intense electric fields in the event is found within one of the flux ropes and is linked with an electron vortex (Fig. 1). The intense electric field is perpendicular to the magnetic field and the vortex consists of electrons that are frozen-in and ions that are decoupled from the fields. The resulting difference in motion between the ions and electrons drifting in the electromagnetic fields drives a current perpendicular to the magnetic field that produces a small-scale magnetic enhancement. The presence of such vortices may contribute to accelerating particles, either through inferred parallel electric fields at the ends of the structure or the excitation of waves, and points to the necessity of better understanding the substructure of flux ropes in order to characterize particle energization in magnetic reconnection. Figure 1: Overview of the electron vortex. (a) Electron-scale perturbation to the magnetic field with a 1s running average removed as observed by the four MMS spacecraft. (b,c) Components of the electric field perpendicular to the magnetic field as observed by the four MMS spacecraft. (d,e) Components of the current perpendicular to the magnetic field based on the curl of the magnetic field (black), moments of the ion and electron distribution functions (blue), and assuming the current is driven by electrons drifting in the electric and magnetic fields (red). (f) Diagram of the electron vortex encountered inside of one of the flux ropes. The observed profiles of the electric field and current are consistent with the indicated trajectories through the structure. By Jade Reidy, Department of Physics and Astronomy, University of Southampton, UK. The formation mechanism of polar cap arcs is still an open question. Since they were first discovered (over a century ago), there have been conflicting reports of polar cap arcs forming on open field lines [e.g., Hardy et al., 1982; Carlson and Cowley, 2005] and on closed field lines [e.g., Frank et al., 1982; Fear et al., 2014]. It is possible that there are more than one type of formation mechanism [e.g., Newell et al., 2009; Reidy et al., 2017]. Reidy et al. investigates the interhemispheric nature of polar cap arcs using low-altitude ultraviolet imaging, combined with particle data, to determine whether they occur on open or closed field lines. Figure 1 shows an example of an image from SSUSI (Special Sensor Ultra-Violet Spectrographic Imager) (left) with the corresponding SSJ/4 particle spectrograms (right). The SSUSI instruments, on board DMSP (Defence Meteorological Satellite Program) spacecraft, are UV imagers that scan across the polar regions, building up images over 20 minutes. The SSJ/4 particle spectrometer is also on board DMSP spacecraft and provides measurements of the particle precipitation directly above the spacecraft. In Fig. 1 the SSUSI image has been projected on to a magnetic local time grid with noon at the top and dawn to the right. The black and grey dashed lines on the particle spectrograms and corresponding black and grey vertical lines on the DMSP footprint (black line on the SSUSI image) give an estimated position of the poleward edge of the auroral for the electrons and ions respectively (see Reidy et al. for details). Multiple sun-aligned arcs can be seen poleward of this edge, hence assumed to be occurring within the polar cap. The arcs seen on the dawnside of the SSUSI image are associated with ion and electron precipitation (indicated by red bars on both the DMSP track and the particle spectrograms), similar arcs were also seen in the opposite hemisphere. These arcs are consistent with formation on closed field lines [Fear et al., 2014; Carter et al., 2017]. The arc seen on the duskside of the polar cap is associated with electron-only precipitation (indicated by yellow bars). This kind of particle signature is consistent with accelerated polar rain and is hence consistent formation on open field lines [Newell et al., 2009; Reidy et al., 2017]. Reidy et al. investigated 21 events in December 2015 using SSUSI images and corresponding SSJ/4 data. Nine of these events contained arcs consistent with a closed field line mechanism, i.e. arcs associated with ion and electron precipitation present in both hemispheres (similar to the arcs on the dawnside of Fig. 1). Six of these events contained arcs that were associated with electron-only precipitation, consistent with an open field line mechanism (e.g. the duskside of Fig. 1). Examples of events containing arcs that were not, at first sight, consistent with either an open or a closed field line formation mechanism are also explored. This study shows the complex nature of polar cap arcs and highlights the needs for future study as there is still much to understand about their formation mechanism. Figure 1. An image from the SSUSI instrument on board DMSP spacecraft F17 is shown on the left. The time at the top of the image indicates the time when the spacecraft crossed 70 degrees magnetic latitude as it passed from dawn to dusk (i.e. left to right). The corresponding data from the SSJ/4 particle spectrometer is shown on the right with the electron spectrogram in the top panel and the ion spectrogram at the bottom. Precipitation associated with polar cap arcs is indicated on the DMSP track on the SSUSI image (indicated by a black line) and the particle spectrograms in red for ion and electron signatures and orange for electron-only signatures. By Luke Barnard, Department of Meteorology, University of Reading, UK. Cosmogenic isotopes, such as 10Be and 14C, provide estimates of past solar activity, constraining past space climate with reasonable uncertainty for several millennia. However, much less is known about past space weather because as we look further into the past, particularly before the space age, reliable records of space weather events become scarce (Barnard et al., 2017). Advances in the analysis of 10Be by McCracken & Beer (2015) (MB15) suggest that annually resolved 10Be can be significantly affected by solar energetic particle (SEP) fluxes. This presents an opportunity to provide a valuable record of past SEP fluxes, and to determine and isolate any SEP effects for the accurate quantification of past solar activity. In Barnard et al. (2018) we assess whether the MB15 reconstruction was biased by significant historic space weather, and whether 10Be can provide a proxy of such events. We compared the MB15 reconstruction of the annual heliospheric magnetic field magnitude (HMF) with two independent HMF estimates derived from sunspot records and geomagnetic variability (Owens et al., 2016), which are thought to be unbiased by space weather events. Computing the differences between the MB15 HMF reconstruction with the geomagnetic and sunspot reconstructions over the 115-year period of 1868-1983, we performed statistical tests to infer whether the differences appear to depend on large space weather events. We use records of ground level enhancements (GLEs) and great geomagnetic storms (GGMS, the top 10% of all storms identified in the aa geomagnetic index), as markers of years with large space weather events. Figure 1 shows the empirical cumulative distribution function (ECDF) of the differences between the MB15 and geomagnetic reconstructions (Fg1), and between MB15 and the sunspot reconstruction (Fr1). Panels A and C show the ECDF of Fg1 (red line) in years with and without GGMS respectively, while Panels B and D show the ECDF of Fr1 (blue line) under the same conditions. Each panel also shows bootstrapped estimates of the ECDF (grey lines) from resampling the complete Fg1 and Fr1 series, independent of whether GGMS occurred. 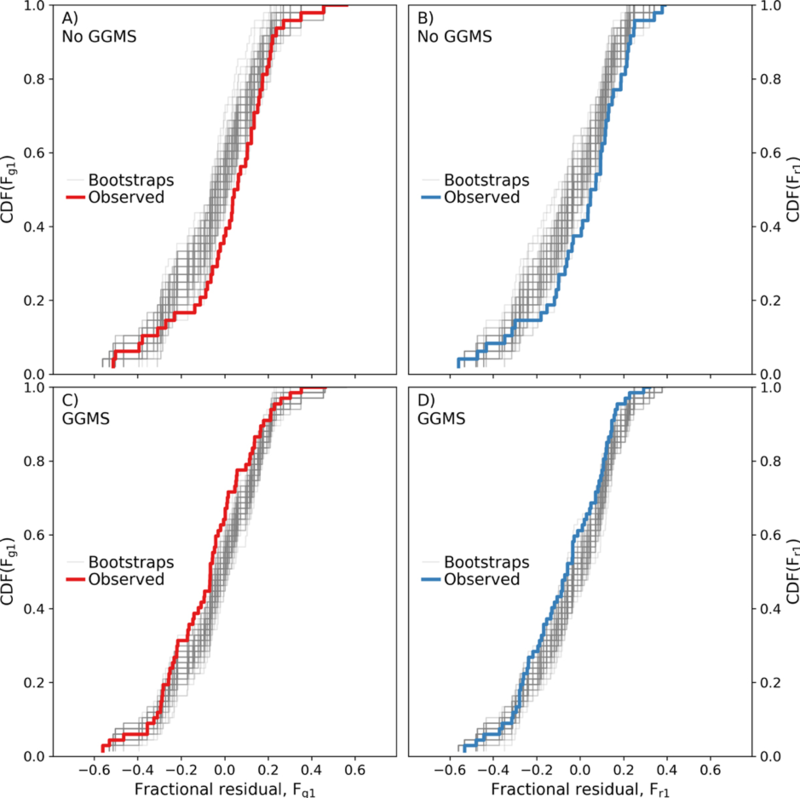 The distributions of Fg1 and Fr1 are different in years with and without GGMS, and, being at the opposite extremes of the bootstrap distribution, are larger than would be expected due to random sampling of the same underlying distribution. Consequently, we interpret this as evidence that large space weather events do bias the MB15 reconstruction. Future advances rely on reducing uncertainty on the inversion of the cosmogenic isotope data, requiring a holistic modelling approach for the Earth system, magnetosphere, heliosphere and local interstellar environment. The research output of the MIST community is important in improving the models underlying the inversion of the cosmogenic isotope data, and consequently for improving the quantification of past space weather and climate. Figure 1. (A) The ECDF of Fg1is given in red, computed for only years without GGMS events. The grey lines show 100 bootstrap estimates of the Fg1ECDF, computed by randomly sampling the Fg1series. Panel B has the same structure as panel A, but instead shows the ECDF of Fr1in blue. Panels (C) and (D) have the same structure as (A) and (B), but instead show the ECDFs of Fg1and Fr1for only years with GGMS events. By Gregory J. Hunt, Department of Physics, Imperial College London, UK. In a magnetized planetary system, large-scale electrical currents that flow along the magnetic field lines are fundamental in the transfer of angular momentum through the coupling of the magnetosphere and ionosphere [e.g., Cowley, 2000]. In the case of Saturn, two such types of these current systems have been deduced from Cassini magnetometer data and studied in detail [e.g. Bunce et al., 2008; Talboys et al., 2009a; Talboys et al., 2009b; Southwood & Kivelson, 2009; Talboys et al., 2011; Hunt et al., 2014, 2015, 2016; Bradley et al., 2018]. The first type is an axisymmetric, quasi-static field-aligned current system, which is associated with the transfer of angular momentum from the planet to Saturn’s outer magnetospheric plasma. The second type is associated with the planetary period oscillation (PPO) phenomenon at Saturn [e.g., Carbary & Mitchell, 2013]. Specifically, there are two rotating field-aligned current systems with oppositely directed currents on either side of the pole. One is associated with the northern hemisphere and the other with the southern hemisphere. These two rotating current systems result in the near 10.7-hour oscillations observed throughout the Saturnian system [e.g., Southwood & Kivelson, 2007; Andrews et al., 2010; Southwood & Cowley, 2014]. Hunt et al. [2018a] performed a statistical survey for both the northern and southern hemisphere auroral field-aligned current regions from a set of orbits prior to Cassini’s Grand Finale, known as the F-ring orbits. This analysis showed in each hemisphere there was the quasi-static and that hemisphere’s PPO field aligned current systems. Interestingly, the PPO current systems’ strengths had decreased by approximately 50% when compared to previous results [Hunt et al., 2014, 2015]. This reduction is in agreement with a decrease in the PPO amplitudes as determined by Hunt et al. [2018b]. The general form and strengths of the overall current profiles for both hemispheres are shown in the figure below. Other differences were observed in the azimuthal field poleward and equatorward of the field-aligned current region. These imply possible seasonal and local time effects on the overall field-aligned current structure and azimuthal field topology. Figure: Overall current profiles versus northern (a) and southern (b) ionospheric colatitudes. Coloured profiles are the F-ring orbit data, with color code shown at the top of the figure. A mean profile is shown by the joined filled circles. 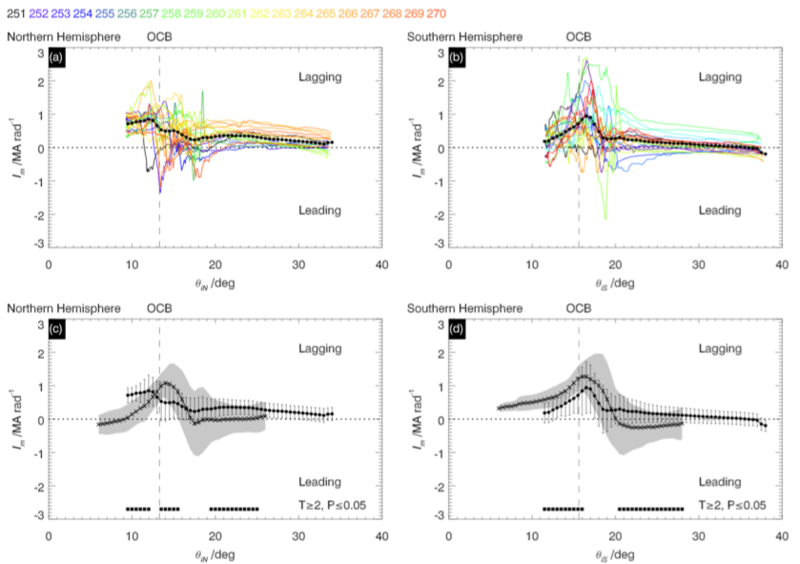 (c, d) Comparison between the F-ring orbit mean profiles from (a) and (b) and the 2008 mean profile (joined crosses) for the northern and southern hemisphere, respectively. The error bars are the standard deviation of the F-ring means. Grey shaded regions are standard deviation of the 2008 means. Black squares show colatitude bins where Welch’s T test shows the 2008 and F-ring averages are significantly different. The open-closed field line boundary (OCB) is shown by the vertical dashed lines. By Catherine Diéval, Department of Physics, Lancaster University, UK. The dayside Mars ionosphere is thought to be reasonably well understood (see e.g. a review by Withers, 2009). The top of the ionosphere is influenced, among various factors, by localized crustal magnetic fields (e.g. Acuña et al., 1999), solar EUV and solar wind input, in the absence of a global magnetic moment. However a peculiar ionospheric feature is still the subject of ongoing research: non-horizontal electron density structures are regularly observed in localized areas with strong and near vertical crustal magnetic fields, in the topside ionospheric levels remotely sampled by the MARSIS radar (Picardi et al., 2004) onboard the Mars Express orbiter (e.g. Andrews et al. 2014; Diéval et al., 2015; Duru et al., 2006; Gurnett et al., 2005). These structures are detectable via oblique echoes returned to the radar after it sends a radio wave pulse through the ionosphere.The reflectors often appear at higher apparent altitude than the surrounding ionosphere, and so are nicknamed "bulges". Previous studies also used radar returns uncorrected for signal dispersion. Actually, the group velocity of the radio waves varies with the refractive index of the plasma layers encountered, until reflection occurs. The apparent ranges of the received echoes are calculated using the time delays of the echoes and assuming the speed of light in vacuum. However this leads to overestimating the ranges,so interpretations on the shape of the structures based on these are uncertain. Our work (Diéval et al., 2018), is a statistical study using timeseries of electron density profiles (electron density function of altitude, corrected for signal dispersion) to study the shape of 48 structures, in their full frequency (thus altitude) range, during the period that Mars Express passes over them. Figure 1 shows that at any frequency, the most frequent shape is the bulge, dwarfing three other types of detected shapes: dips, downhill slopes and uphill slopes. All these shapes are inclined, thus able to reflect oblique echoes. Interestingly, bulges were reproduced in simulation results of Matta et al. (2015). Figure 1: Distribution of the four simplest shapes of structures as a function of frequency, for the 48 events, displayed as colored symbols: bulges (red dots), dips (black diamonds), uphill slopes (blue ‘x’), downhill slopes (green ‘+’). Data points at frequency levels within in the sensitivity gaps are not displayed.